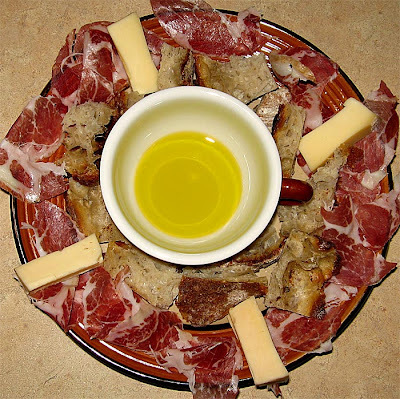 Sunday comfort food - an improvised appetizer dish featuring coppa, a delicious fontina, olive oil (Nuñez de Prado, good for dipping), and potato and thyme bread from Hungry Ghost. One day I'll do a writeup on Hungry Ghost, a place Northampton is maad lucky to have. Their bread + good olive oil = good. As to the fontina, Whole Foods has it in two varieties. One is a whitish color, about $10/pound, the other is more yellowy and is $16/pound. The former is a pretty boring cheese, tasting creamy but little else. The latter is real fontina - complex, rich, nutty, pungent - flavors brought out by ageing. The former isn't worth its price, but the latter is. There might be some places in Springfield where you can get coppa, something I plan to investigate.